The band which gave you your favorite songs like "Seize the Day", "Burn it Down", "Beast and the Harlot", "Bat Country", amongst many more now comes to your town! Yes Avenged Sevenfold is heading your way! Hailing from Huntington Beach, California, the band enjoys worldwide fame in metalcore, hard rock and heavy metal music genres. Consisting of best musicians of our times, the band has grown in leaps and bound and today their music is considered integral to heavy metal genre. 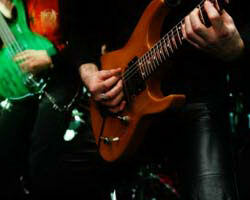 Through their constant improvisation and evolution, they have given a whole new meaning to heavy metal music. Avenged Sevenfold, named after the biblical story of Cain and Abel (it is not a religious band though), started in 1999 when its original members M. Shadows, Matt Wendt, The Rev, and Zacky Vengeance got together to play some awesome heavy metal music. Out of its original members only Vengeance and Shadows are still with the band. Synyster Gates and Johnny Christ, the band’s other two members, joined later. It could be assumed that the band members wanted to become musicians from the outset as they were still in high school when the band was formed. These "kids" were highly influenced by bands like Rage Against the Machine, The Misfits, Alice in Chains, Metallica, Dream Theatre, Pantera, Guns N’ Roses and Bad Religion. Since they were influenced by so many bands singing in various musical genres, their music too is diverse. To date, the band has released five studio albums namely, Sounding the Seventh Trumpet , Waking the Fallen , City of Evil , Avenged Sevenfold and the most recent Nightmare . Sounding the Seventh Trumpet was Avenged Sevenfold’s debut album which was released in 2001. The album’s got its name from biblical prophecy of the end of this world with sounding of the last (seventh) trumpet. The prophecy itself emerges from the book of Revelation. Irrespective of the roots of its nomenclature, the album had been a moderate commercial success, however it won accolades from music lovers and critics. Allmusic gave the album three stars out of five. It had 13 singles and was produced by the band and Donnell Cameron together. In 2003, Waking the Fallen was released, the band’s second album. It was also the album which made this bunch from Huntington Beach a household name. The album which was certified gold record is also profanity free. This album alone made the band such a hit sensation that they were compared to their idols, Metallica, Misfits and others. Some of the album’s hit songs were "I Won’t See You Tonight", "Waking the Fallen", "Eternal Rest", just to name a few. Avenged Sevenfold’s third album was City of Evil . Released in 2005 under Warner Bros. Records, it was a stupendous hit. Unlike the band’s previous two albums which had strong shades of metalcore music, this album was predominantly marked by classic heavy metal and hard rock music. This album was different in another aspect from its predecessors as well; there were no screaming vocals. It has also been the most commercially successful album of the band to date, selling well over 2 million copies worldwide and well over 1 million records at home. Certified platinum, it debuted at position no. 30 on the Billboard 200 chart. The band continued its success story with the release of their fourth album, Avenged Sevenfold , in 2007, also under the Warner Bros. Records. Also a gold record, it debuted at position no. 4 on the Billboard 200. It had unforgettable songs like "Dear God", "A Little Piece of Heaven", "Lost", "Brompton Cocktail", "Unbound (The Wild Ride)", "Gunslinger", to name just a few. Nightmare , the band’s latest release in 2010, was also released by Warner Bros. Records. This album, too, has followed in the footsteps of its predecessors both in terms of being a commercial success and critical acclaim. It is worth mentioning here that The Rev, the band’s drummer from the very beginning, had died before the release of this album and hence another world famous drummer, Mike Portnoy, was asked to work in his place. While giving the album eight out of ten marks, Terry Bezer of Metal Hammer classified the album as "the ultimate tribute to a fallen friend." These extraordinarily talented musicians are touring all over. As their concert tickets get sold out rather quickly, be sure to secure the best place for yourself and your loved one by buying Avenged Sevenfold tickets now!